Eggnog Cake – Browned butter, eggnog cake with eggnog buttercream and cinnamon chip ganache. It’s time for a revisit of an old cake. 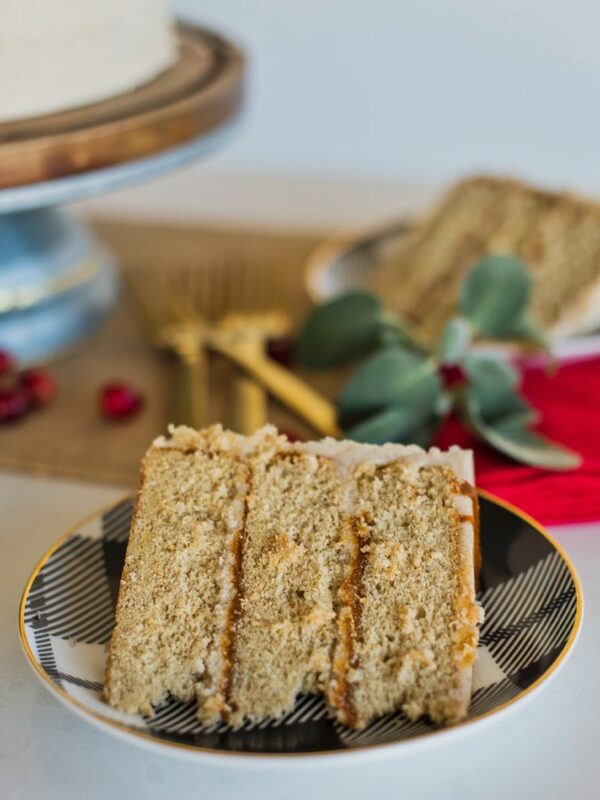 This week, I’m sharing my Eggnog Cake. I first made this cake two years ago and while I loved it then, I knew I could improve it. I also tried another recipe from Tessa Huff, which I also liked, but felt like I could change up a bit. So, I decided to merge the two recipes and come up with one of my own. For the cake layers, I wanted a really rich flavor. I’ve combined actual eggnog, browned butter and lots of yummy spices. For the frosting, I also added a bit of eggnog and cinnamon. And to take this cake to the next level, I added my cinnamon chip ganache between each layer! When baking any cake, especially one that is a white or yellow based cake, it’s so important to watch the cake like a hawk while it bakes. Those last 5 minutes are crucial and if your oven runs hot, you can easily over cook the cake layers. Over cooking the cake layers is often why the cake tastes dry. 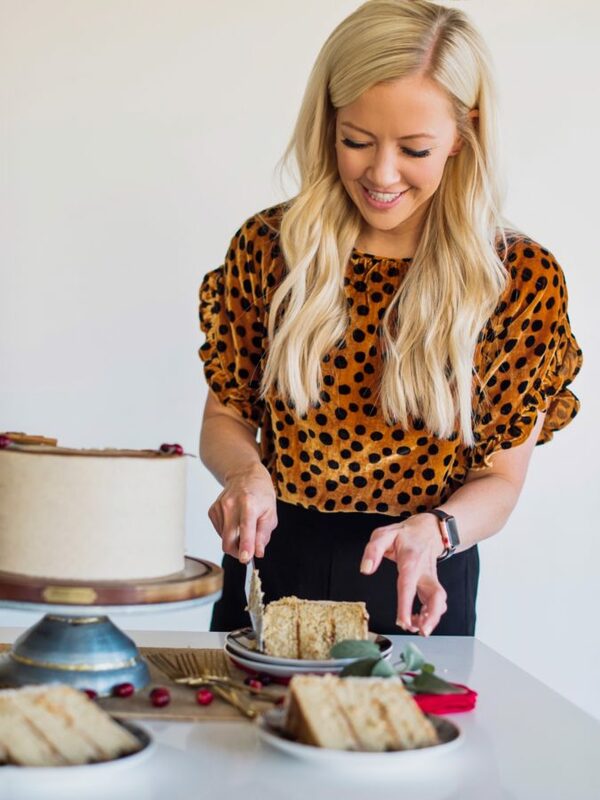 To avoid this, make sure you take the cake out of the oven when a few moist crumbs come out on a toothpick when inserted into the center of the cake. The flavor in this cake is just out of this world good. 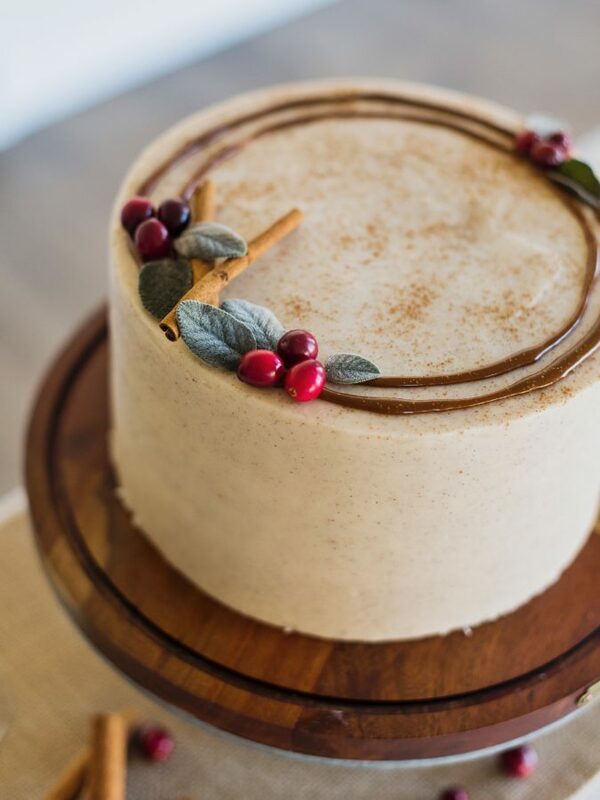 Browned butter, eggnog spice cake with eggnog buttercream and cinnamon chip ganache. In a medium saucepan, melt the one cup of butter over medium-high heat. Continue to cook, swirling occasionally, until the butter is browned and fragrant. The butter will foam up a bit and there will be bit of browned butter at the bottom of the pan when it's done. Remove the pan from the heat and transfer the butter to a heat-safe container. Refrigerate until the consistency of softened butter. (I made my browned butter the night before baking and took it out of the fridge a few hours before I started so it had time to soften). Preheat your oven to 350 degrees F. Spray your pans with nonstick spray, line the bottom of each pan with parchment paper rounds and spray again. Set aside. In a medium sized bowl, combine and whisk together the flour, baking powder, salt, cinnamon, ginger, nutmeg and cloves. Set aside. In the bowl of a stand mixer fitted with the paddle attachment, mix the browned butter until smooth. Add the granulated sugar and brown sugar, and increase the speed to medium-high. Beat the butter and sugars for about 3 to 5 minutes. Scrape down the sides of the bowl and mix again for another 30 seconds. With the mixer on medium-low, add the eggs, one at a time, mixing until combined in between each addition. Add the vanilla. Mix until incorporated and scrape down the bowl again. Turn your mixer to low speed. Add the flour mixture alternating with the eggnog, starting and ending with the flour. Mix on low speed for 30 seconds or until combined. Do not over beat your batter. 1. In the bowl of a stand mixer fitted with the paddle attachment, mix the butter and cream cheese until smooth. With the mixer on low, gradually add the remaining ingredients until combined. Turn the mixer to medium-high and continue to beat the buttercream until light and fluffy, about 5 minutes. In a microwave safe bowl or over the stove, heat the cream until simmering. Pour the cream over the cinnamon chips and stir until the chips are melted and the mixture is smooth and silky. The mixture cool slightly before using. It will thicken up during this time. After leveling your cakes, if needed, spread a dab of frosting on your cake board, and place the first cake layer, top side up, on top. 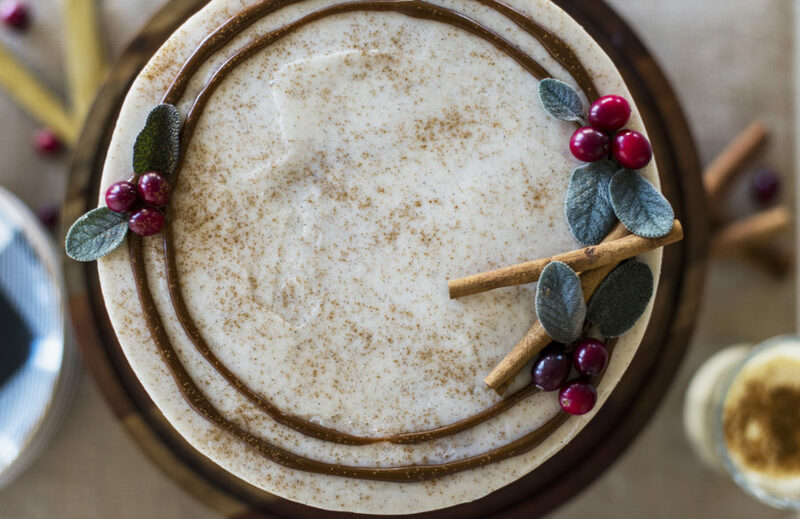 Cover the first cake layer with about 3/4 cup eggnog buttercream, and then drizzle with the cinnamon chip ganache. 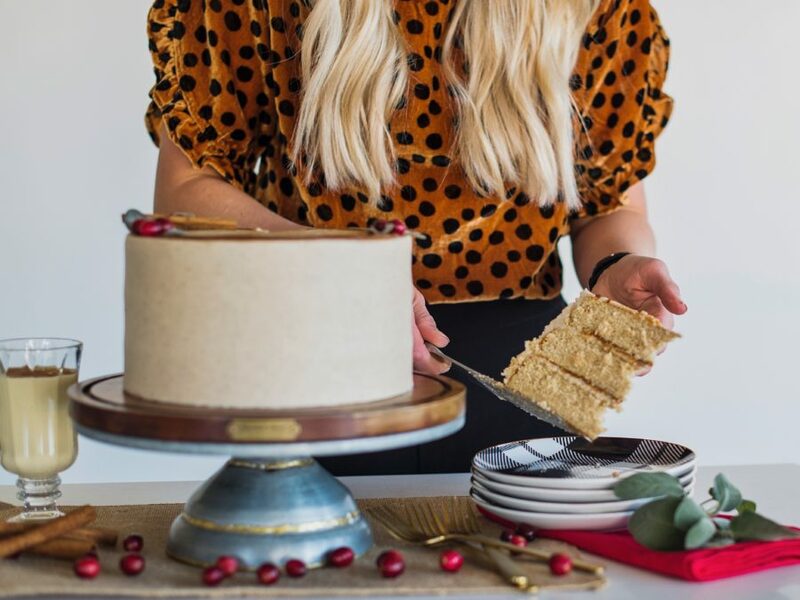 To make sure the ganache doesn't come out the sides of the came, use your offset icing spatula to create a little barrier around the edge of the cake or pipe a rim of frosting around the edge of the cake. Repeat step 2 with your second cake layer. The final cake layer should be placed top side down. Apply a thin layer of frosting around the cake. Freeze the cake for 10 to 15 minutes to set the crumb coat. Continue frosting the cake with the remaining buttercream. Use extra cinnamon chip ganache as a drip on top. Your cake has four layers but in the assembly you said there will only be a third cake if using six inch…did you double the recipe or halve each cake? So in the instructions, I’m saying that you’ll repeat the stacking process with the second and third cake layers as you add the filling and then use the final (fourth) cake layer to top it off (if you’re using 6-inch pans). That final (fourth) cake layer should be placed top side down. I don’t have access to cinnamon chips. What can I use instead? Could I add cinnamon to the melted white chocolate or would that not work? Yeah, definitely, start with a small amount and taste test along the way. Hi! Love your cakes! 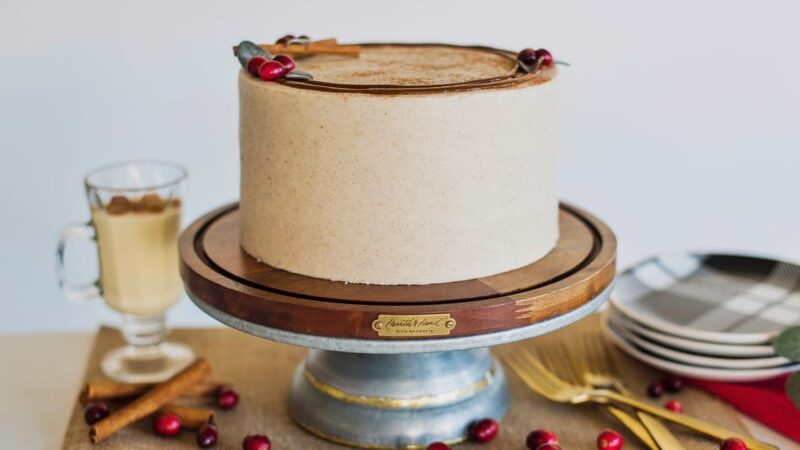 I was wondering what the leaves and berries are on top of this cake? Thanks! Thank you. It’s cranberries and sage leaves.